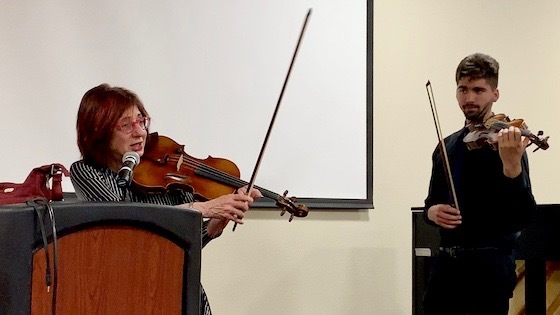 April 3, 2019, 11:40 PM · When it comes to violin pedagogy, Mimi Zweig is kind of a rock star. A longtime professor at Indiana University's Jacobs School of Music, Zweig is the director of the IU's Pre-College String Program as well as its Summer String Academy. She also founded the online teaching resource, Mimi Zweig String Pedagogy, and she helped develop string programs for children at the North Carolina School of the Arts, the Wisconsin Conservatory of Music, and the String Academy of Wisconsin at the University of Wisconsin-Milwaukee. Having gone to IU myself, I had long heard about Zweig's excellence, not only as a teacher of young violinists, but also as a teacher of teachers. Somehow, though, I had never seen her teach a master class. 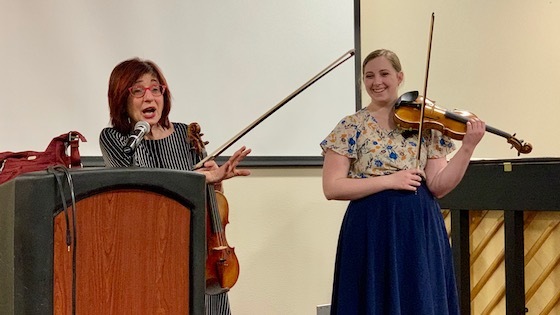 So when I saw that she would be teaching a master class at the American String Teacher's Association Conference last month in Albuquerque, I knew that this was a must-see occasion. Apparently I was not the only person who felt this way; the large convention center room was packed, with a row of people standing in the back! Two lucky students got to work with Zweig: Holly Sidney, 20, of Castle Rock, Colo.; and Luiz Freire, 21, of Brazil. Throughout the class, Zweig struck a balance between being almost motherly and being demanding; speaking to the imagination, explaining the physics of sound, making stylistic points and showing the mechanics of specific techniques. She emphasized early on that no one was to apologize for making mistakes. "I'm teaching in a non-judgmental environment," Zweig said. "Mistakes are neither good nor bad, they are just information." Sidney performed first, playing the first movement of "Symphonie Espagnole" by Édouard Lalo, playing with good accuracy, but on the careful side. When she finished, Zweig started by talking about Lalo, a French man, writing this piece for one of the most important Spanish violinists of the time, Pablo de Sarasate. Mimi Zweig works with violin student Holly Sidney. Zweig asked, what is the flavor of this piece? Is it heavy? No, it is lightweight. "We have to isolate what gives us that lightweight feeling and Spanish flare," Zweig said. She suggested that its recurring habanera rhythm -- a triplet figure followed by duplet (see m. 9) -- creates that feeling. "That becomes the signature rhythm of this piece," she said. Not only that, but in the score, one of Lalo's first written indications is "molto ritmico" - very rhythmic. "Let's try to play this with very good rhythm," Zweig said. On her first attempt, Sidney missed a few notes, and then Zweig gave her permission to actually miss more notes. "Miss every note! We're going to get the rhythm," she said. Approaching it this way, Sidney actually missed fewer notes and got the rhythm as well. "You definitely want to set your habanera rhythm, right from the start," Zweig said. She also suggested that a faster triplet in the 10th measure of the piece brings to mind another Spanish instrument -- the castanet. "Has anyone heard - there is an entire castanet concerto on Youtube -- you can't even believe these two pieces of wood are so musical!" And the opening, what is it like? A trumpet! "A trumpet has to articulate, they have to tongue every note," Zweig said, "so we'll use our bow to do the same thing." Then of course, there is the matter of the complicated arpeggio passage around letter B, that goes way high on the fingerboard. "We need to give you more virtuosity and speed," she said. How to do that? She had a few ideas. In addition, it's important to visualize how the down-bow and up-bow works. The down-bow pulls the string from the left, and the up-bow pushes the string from the right. "The string vibrates east to west, not north to south," Zweig said. "So if we are pressing down on the string (with the bow), we are stopping the vibration." Rhythms help the brain take a "whole lot of notes" and arrange them into smaller groups. Breaking down a passage in this way is effective practice and helps solidify those notes for the fingers. Next, Luiz Freire played the first movement from W.A. Mozart's Concerto No. 4 in D major. He played with an excellent musical sense, with a lot of emphasis on the left hand. She explained that it's worth going to the urtext and looking at Mozart's original bowings and dynamics. Mozart, after all, was a fine violinist. "What the composer asks, is going to be what is most beautiful," she said. The eight notes, for example, at the beginning of the solo entrance, m. 44, need no crescendo, they can be left to laugh. "It's just 'ha-ha-ha-ha ha-ha-ha-ha!" After he played again she asked him, "Are you thinking of the left hand, or your bow?" "The left hand," he said. "I know!" she said, "Sing with your bow! I don't want you to have a fear of going faster and getting higher." She also talked about releasing tension from the neck, as it is the major connection between your brain and the rest of your body. "If you put tension in your neck, you've made a major traffic back-up," Zweig said. "If you release the neck, it's miracle. You make progress without practicing!" She asked Freire what the purpose of a slur is, in classical music. His answer, "more going," as in, it indicates motion. "They thought very carefully about where they placed slurs," she said, and so it is important to think about what that means for the music, and to see where the original slurs are placed. Also, if you are doing a lot of spiccato in Mozart, consider this: "The classical bow was closely related to the Baroque bow," Zweig said. It's a bow that did not naturally bounce a lot, so "don't take the bow so much off the string." April 4, 2019 at 01:19 PM · Love Mimi... she is a great teacher and more of the nicest person i know. I was at IU from 1986-95, when were you at IU? April 5, 2019 at 10:24 PM · I was there '90-'92!